This Beef Chowmein is a very filling meal ! Try out this amazing bake of meat, vegetables, rice and noodles and tell me if you've liked it ! Your suggestions for this ..
Chinese Sizzled Meatballs With Vegetables And Rice is an irresistible mouth-watering main course meal recipe. Beef Chow Mein is simply a delicious mouth-watering side dish recipe. Try this amazingly tempting Beef Chow Mein I am sure you will get a lot of compliments for this one. Chowmein is a delicious recipe that is simply easy-to-prepare. Once you have this recipe, I am sure you will always crave for it. The Chow Mein Casserole recipe is easy to follow and the end result is extremely tasty. My family loves the flavors of this dish. this chow mein recipe is a steak and vegetable preparation with bean sprouts. The cubed steak is simmered to tenderness and finshed by cooking with chinese vegetables, .. Hamburger Chow Mein is a tasty meat dish that is simply irresistible. The dish is filling too. 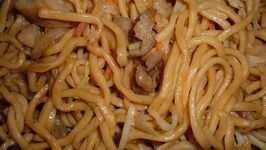 Try this wonderful Hamburger Chow Mein recipe! Ground Beef And Rice is a unique and winning dish that is perfect for your dinner parties. Surprise your guests with this filling and tasty dish. Hamburger Casserole is a tasty and filling meat preparation that is perfect for your dinner parties or even an informal get together at home.